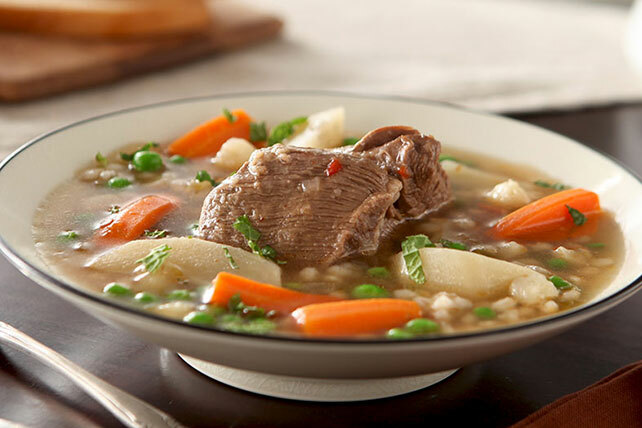 Enjoy our Heart Vegetable Beef Soup. With big chunks of beef and winter vegetables, this is exactly the kind of soup people want in the winter months! Place meat in stockpot. Add broth; bring to boil on medium-high heat. Cover; simmer on low heat 1 hour, skimming surface occasionally. Spoon 1 piece of meat in each of 8 bowls. Ladle broth and vegetables over meat. Sprinkle with mint. This delicious soup is always served during the Alasitas Festival that takes place in La Paz, Bolivia and around Lake Titicaca. The festival is a celebration of the Aymara Indians. This soup is a great way to use any extra vegetables and meat in your refrigerator. Substitute 5 cups each regular beef broth and water for the fat-free reduced-sodium beef broth.